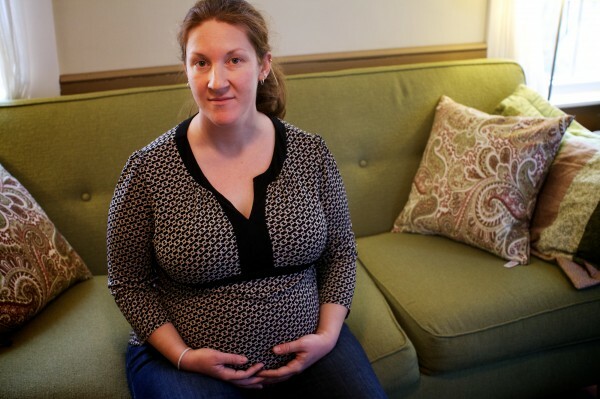 Toxic flame retardants found in couches in Maine and U.S.
Jenny Rottmann of Portland is nine months pregnant. Her son is due next week and she's concerned about the potentially harmful flame retardant chemicals in her couch. PORTLAND, Maine — When Jenny Rottmann and her husband bought a pale green couch a couple of years ago at a local department store, the couple had no idea it had been treated with potentially toxic chemicals. After learning about a national study into the use of flame-retardant chemicals in household furniture, Rottmann sent a piece of her couch’s foam cushion to researchers for testing. Now nine months pregnant, she recently found out that her couch was treated with Firemaster 550, a mix of chemicals that contains two ingredients targeted for review by federal environmental officials because of potential health hazards. Studies have found that exposing rats to high doses of Firemaster 550 can lead to lower birth weight and genital and skeletal deformities. “It’s something that I’d be concerned about no matter what, but finding this out a couple days before I’m about to deliver a baby really is infuriating to me,” Rottmann said Wednesday at a press event at her Portland home. Rottman is employed by the Environmental Health Strategy Center, the Maine-based advocacy group that organized the press conference. The peer-reviewed study by researchers at Duke University, Boston University and the University of California-Berkeley was published Wednesday in the journal Environmental Science and Technology. Researchers tested foam from 102 couches purchased in the U.S. between 1985 and 2010. They found that 85 percent contained toxic or untested flame-retardant chemicals, including Rottman’s couch and another sofa from Portland. Couches purchased after 2005 were of particular concern. Nearly 40 percent of the couches, including the other Portland sofa, contained a flame retardant called chlorinated Tris that was voluntarily removed from children’s pajamas in the ’70s after studies found it could cause cancer. The flame retardants also are associated with hormone disruption and neurological and reproductive problems, said Steve Taylor, program manager at the Environmental Health Strategy Center. The chemicals are added to cushions for couches and other furniture, then leach out over time into household air and dust that’s breathed in by children, adults and pets, he said. Infants can pick up the chemicals from dust as they crawl on the floor. The American Chemistry Council, the chemical industry’s national trade group, responded to the study in a statement Wednesday, saying furniture manufacturers use flame retardants to meet established fire safety standards that help save lives. Use of flame-retardants in furniture is on the rise, even though the chemicals haven’t been proven to provide fire protection as advertised, Taylor said. A recent investigation by the Chicago Tribune into flame retardants found that the chemical industry has manipulated scientific findings to overstate the effectiveness of flame retardants and downplay the health risks. Firefighters also have spoken out against the chemicals, which can be harmful when released into the air during a fire. Cancer-causing fire retardants are also found in fine soot which can be absorbed into firefighters’ skin, said John Martell, president of the Professional Firefighters of Maine. “We advocate for the chemical companies to look for safer alternatives to flame retardants,” said Martell, a firefighter and paramedic in Portland. Widespread use of residential sprinklers, which are required in new homes in Portland as of 2010, could reduce the need for chemical flame retardants and save more lives, he said. A decades-old California law, now under review, led to widespread use of flame retardants in furniture. Intended to prevent house fires, the law requires upholstered furniture sold in the state to withstand an open flame for 12 seconds, prompting furniture makers to saturate cushion foam with the chemicals to meet the standard. Furniture makers that sell their products nationally tailored their production to the California law. Under the nation’s chemical safety law, the 1976 Toxic Substances Control Act, federal regulators can step in to restrict use of a chemical only after proving it’s harmful. Manufacturers can sell products without first proving they’re safe. “Just the fact that [the chemicals] are untested is upsetting to me,” Rottmann said. There’s no requirement that couches — or many other products, such as car seats and mattresses — be labeled to indicate whether they’ve been treated with fire-retardant chemicals. Rottmann said she wants to see Congress overhaul the chemical safety law to better protect consumers. Maine passed a landmark law in 2008 designed to protect children from unsafe chemicals in everyday products. Called the Kids Safe Product Act, the law came under fire from manufacturers and business groups last year who said it gave state regulators sweeping authority to ban products with little regard to evidence of their safety. The law was amended to direct the state Department of Environmental Protection to focus its regulatory efforts on a smaller list of chemicals with the strongest evidence of toxicity. Consumers can seek retailers that advertise furniture that’s not treated with flame retardants, Taylor said. Families also can vacuum with a HEPA filter and use wet mops to clean floors to minimize dust containing flame-retardant chemicals, he said. Furniture and products that have a label stating that they meet the California standard, called TB 117, nearly always contain the chemicals, according to the Green Science Policy Institute. Furniture without the label often does, as well. Baby products made with polyurethane foam, including nursing pillows, high chairs and strollers, likely contain flame retardants, according to the institute. It’s too difficult for consumers to know whether household products are safe, Rottmann said. She doesn’t plan to get rid of her couch until better regulations are in place and she can be sure that her new sofa won’t harm her growing family, she said.